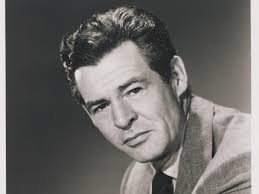 6 Degrees can’t let the month pass without a word on Robert Ryan. One of my favorite actors has been featured all month on Turner Classic Movies. Robert Ryan was a workhorse, a character actor, a film noir star, and at times a B movie actor with a ruggedly handsome profile that rivaled his co-star and friend, John Wayne. John Wayne was an icon, but Ryan was the stalwart trooper who worked in so many genres and cut through generations of rapidly changing film audiences with differing tastes and mores. He was the down and out boxer in the film noir classic The Set Up, directed by The Sound of Music director Robert Wise. He was the love interest in one of Marilyn Monroe’s early hits, Clash by Night. He starred with John Wayne in. The Flying Leathernecks, a bad-B, and with Pat O’Brien in Marine Raiders, which is highlighted with the singing of the venerable Marine fight song, Bless Them All. Ryan was a Marine in real life and he used that tough-guy persona in his performances. Moving from the film noir period, he went on to star in movies like Lonelyhearts, with Montgomery Clift, and the unique version of Erskine Caldwell’s novel, God’s Little Acre. He was the heavy in many films, most notably with Spencer Tracy in Bad Day at Black Rock and Robert Mitchum in Crossfire. In the sixties, he was in the classic The Wild Bunch, as well as the war films, The Longest Day and The Battle of the Bulge. Ryan was friends with John Wayne, but his politics came down on the other side of the fence. He was an ardent liberal who fought for Civil Rights. One of the lighter stories surrounding Ryan’s and John Wayne’s friendship was regarding the time Robert Ryan went on a radio program and condemned the John Birch Society. When he returned home, there was a man with a shotgun standing in his driveway. As he pulled in, he realized it was his old friend, Duke Wayne, who had dropped by just to insure that there would be no trouble for Ryan! Marine raiders was one of my favorite movies as a kid! Very nice article MLJ. Mr. Ryan will be missed, Thank goodness he left a treasure trove of his craft with us on film. Thanks, Friend Freak! I am a huge fan of Robert Ryan, as you can tell. Recently read “The Lives of Robert Ryan” by J.R. Jones. Great bio of Ryan! I recommend it. Next Next post: Summer Film Series at Tampa Theatre: The ones to see at the movies!